That’s the Question, let’s do the Answer. Let’s go! Today’s question was sent into me via Instagram and I am NOT going to give you not one way to promote your business for free, not two, but five ladies and gentlemen. So without further a-do let’s jump into five ways to promote your business for no money whatsoever. Nada! Promote your Business by Using your existing clients get them to give you a reference or a testimonial, direct them to your Google + page or your Facebook page or even have them fill out a form you can put on your website, also start up and recommend a friend scheme where if people that you already service recommend one of their friends or their colleagues you will give your client a little something for doing that and saving you the hassle of trying to find my client yourself List your business in all local and relevant business directories that are both online and also get circulated offline.With a lot of publications you are allowed to put in a basic listing for your business for absolutely free! Promote your business by offering something of value. 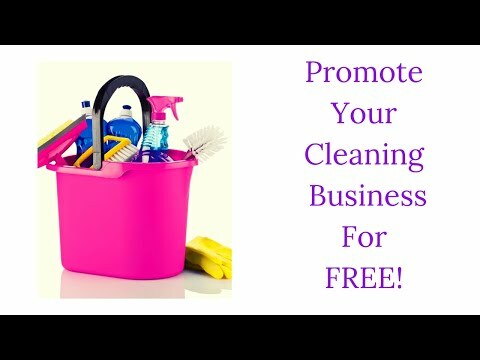 Offer a blog a series of how-to videos or some tutorials of how to clean certain items, giveaway cleaning tips giveaway cleaning organisers. Do something – funny memes anything to get people sharing your post because it’s so awesome or it’s so funny or so interesting or it’s so problem solving that they need to go share it with somebody else. All those people liking retweeting plus entry sharing all of those good things are marketing on your behalf and spreading your good name and your good brand and your super content throughout the interweb. How fabulous for free! Deliver great customer service don’t just be there for your clients whenever there’s a problem and that’s the only time they ever hear from you put in the occasional phone call maybe on a quarterly basis asking if everything’s okay, is everything’s going well with the service, if there’s anything you could help them with. Send out regular customer satisfaction surveys, put in the odd birthday telephone call, send a Christmas card put in exceptional customer services so that your clients can’t bear the thought of going somewhere else and they will not only tell people what great cleaners you are but also what good people you are because whenever they needed you you are there and you are also there when they don’t need you just to wish on a happy birthday. If you would like to receive further marketing ideas for small business owners, all you gotta do is subscribe to my newsletter list or add a free business listing on https://www.abbeybroadway.com/post-a-listing/ and you will receive that and lots of other free content that you would have heard about mentioned in my previous blogs thank you so much for being here it’s been lovely to see you. Until next time, goodbye .